Our welcoming grand foyer greets you as you enter, leading to an elegant dining room to enjoy our popular continental plus breakfast. 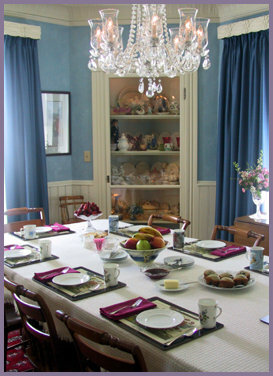 The Inn's comfy living room can host a number of practical and entertaining options. A perfect place to finalize an itinerary, catch up on the day's events with the region's newspapers and on cable TV, put a dent in your reading intentions, and it's often the place to share dining reviews, a performance critique and the best bets for distinctive gifts, antiques, fine art and local shopping. 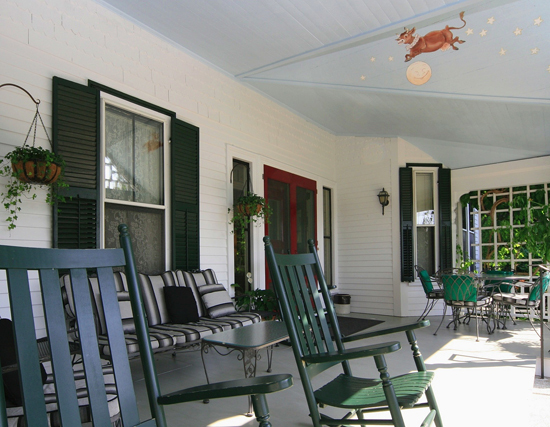 From the generously proportioned open porch with its folk-art mural, you take in the graceful sloping lawn with mature trees and colorful plantings revealing scenic vistas across the village. These are grounds made for a picnic. In addition, you'll find seating randomly placed for those quiet moments, a vegetable garden next to a popular horseshoe pit and croquet available for the front lawn. Favorite gathering and relaxing spaces are the living room and front porch, where you can enjoy the quiet and allow your mind to slow to the pace of earlier times. On the porch you can also watch the cow jump over the moon (click the image at right to see it).